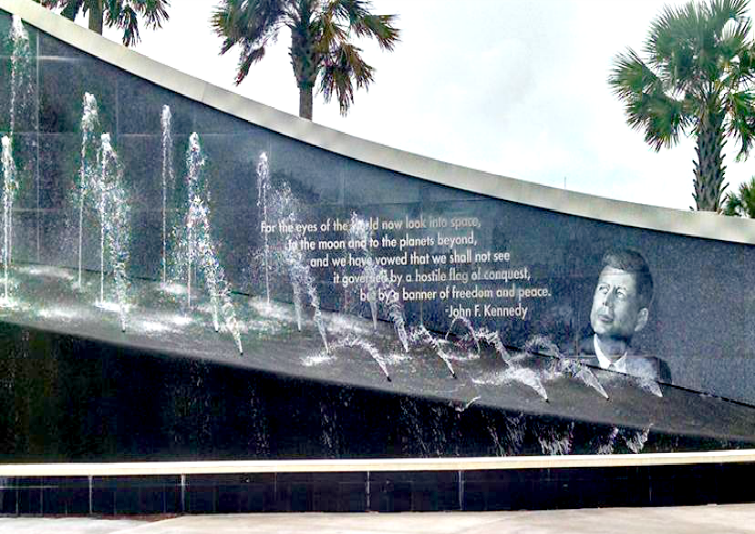 How many of you have ever visited the Kennedy Space Center in Florida? If you have never visited, you really need to add it to your bucket list. The center has been NASA's primary launch center of human spaceflight since 1968. The late 1960's was big time for human space travel and it often dominated the headlines. They invite visitors to watch rocket launches from the Kennedy Space Center Visitor Complex which offers the closest public viewing areas. If you visit their website and/or follow them on social media, you can find out when the next launch will be and plan your visit around it. Since we're big fans of street art and outdoor wall murals, I wanted to document the JFK Kennedy Space Center Wall here on our blog for all of our readers to see. It's quite large in size and I really enjoyed standing in front of it and watching the water fountain do its thing. You can double click on our photo to have it open up in an enlarged size to see all of the beautiful details.